There is nothing more fun than getting brand new make-up. Whether it’s Mascara (my personal favorite) eye shadow, eyeliner, or lipstick, it’s all fun and freaking fabulous. I am all about trying as many different kinds of something as I can, even when I think I’ve found “the one”. I also get an Ipsy Glam bag once a month for 10.00 and I always look forward to getting it. I’m going to start out with Mascara since it’s my personal favorite. I think I have tried every drug store brand out there. I refuse to spend more than 10 or 12 bucks on a tube of mascara, even if they claim to make my eyes look like I have false lashes on. 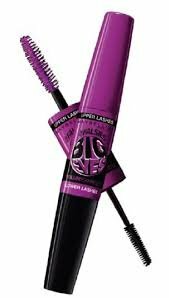 Right now I’m using Maybelline Big Eyes. It has a large brush on one end for your upper lashes, and a smaller brush on the other end for your lower lashes. I use the smaller brush on my upper lashes too though. It gets every little lash, and then I do one more coat with the big side of the brush. So far I like it. It will probably stay a favorite of mine.